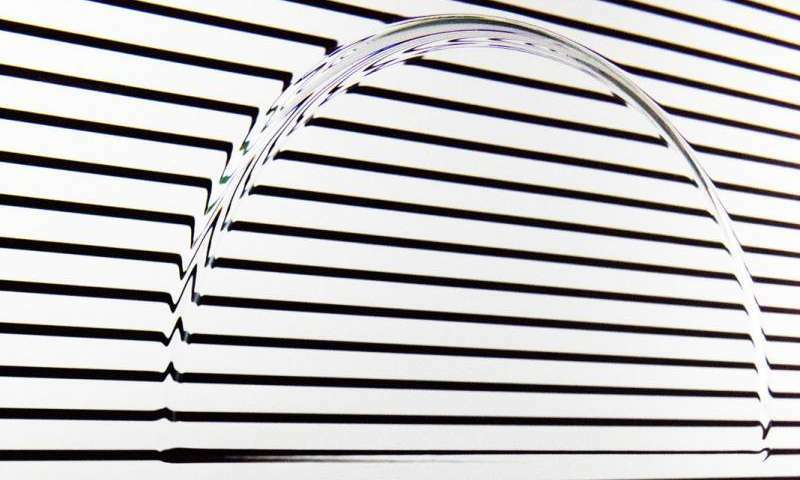 A new Fraunhofer technique makes it possible to bend sheet glass into complex or unconventional shapes with the help of laser beams. This opens up a whole new range of potential products for architects and designers. 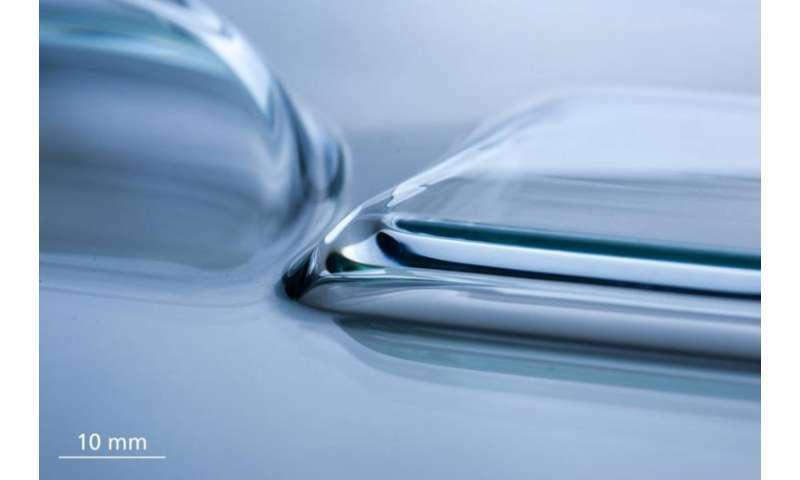 The researchers are taking advantage of a particular attribute glass has of becoming viscous and therefore malleable when exposed to high temperatures. Precise calculations and gravity do the rest. A laser beam moves across the surface of the glass with absolute precision, following a preprogrammed if still invisible path. Every now and then, the beam stops, changes position and moves on. The four-millimeter-thick sheet of glass is in an oven that has been preheated to just below the temperature at which glass begins to melt. The glass now starts to soften at the points the laser has heated and, thanks to gravity, the heated portions sink as if they were made of thick honey. Once the desired form has been achieved, the laser is switched off and the glass solidifies again. The result is a fascinating shape with bends featuring small radii, waves and round protrusions. This is how lasers can be used to help bend sheet glass in a process developed by the Fraunhofer Institute for Mechanics of Materials IWM in Freiburg im Breisgau. The whole process is based on a particular physical characteristic of the material; unlike metal, for instance, glass does not have a definitive melting point at which it liquefies. Instead, when exposed to a certain temperature range, it softens and becomes malleable. Fraunhofer IWM's laser-supported technique allows architects and also industrial designers to make use of shapes that were previously difficult and costly to produce. Here, sheet glass is shaped without the need for a bending mold to apply pressure. In this way, the new process doesn't leave behind any unsightly marks – the flat glass surfaces remain visually undistorted. Giving a product the required shape starts with programming the process workflow. Geometrical data is used to define the sequence of precisely where, when and for how long the material will be heated, as well as to create the program that will control the laser beam. This factors in options to have the laser stop for a moment, heat a single point multiple times or change the intensity of the beam. "Thanks to our technique, manufacturers have a cost-effective way of producing extremely customized glass objects in small batches or even as one-offs," says Tobias Rist, scientist at Fraunhofer IWM. From placing the glass in the oven to cooling it off, the whole process takes approximately half an hour. Depending on the shape required, it takes only a few minutes for the laser to do its job. "A distinct benefit for manufacturers is that the machine is only occupied for short times. The workpiece is placed in the preheated oven and lasering can begin after just a few minutes," Rist explains. Since the glass is removed for cooling, the bending oven is then free for the next workpiece and so doesn't have to be cooled down. This offers significantly greater energy efficiency than conventional processes – the laser does require a lot of energy, but the very short processing times save electricity. Fraunhofer IWM's Machining Processes, Glass Forming Group uses a powerful CO2 laser model. This type of laser is commonly used in materials processing in the industry. The laser beam is not applied to the workpiece directly, but rather directed via adjustable mirrors fitted to the interior of the oven. This provides an extremely fast and simple way of positioning the laser beam because it means the laser apparatus itself can remain static. The group's researchers are currently able to process sheet glass with edges of up to 100 centimeters and alter the shape of both sides of the glass. The researchers' next step is to experiment with different types of glass and explore further manufacturing variations with a view to expanding the range of shapes products can take.